So, I grew up in the early 80s… and in that light.. who the hell didn’t want to build robots? With star wars and all the other cool shnit that came out? Anyways… I finally have the means to pursuit this childhood dream! I went to start a new project, something I like using circuits.io for; kind of to prove the concept. So, I click on the link on my cylon post and it’s gone! It forwards to library.io which appears to be owned by autodesk. So, they’ve taught (or AI has learned; semantics) AI to do some pretty phenomenal things. Much more advanced than simply playing a shooting game. However, it’s very cool to be able to watch the actual progression of AI learning to do its thing. I’m really jazzed about what AI can bring us, especially what I can learn to do with AI. I already have my first project in mind. It’s simple, and basically a client of a text-based game, but you have to learn somewhere right? Enjoy the view! Sweet! I use Visual Studio for a lot of things in my life… C# development, Xamarin, Ionic / Angular (VS Code)… and I just accidentally happened across an extension that allows you to work with your arduino in Visual Studio via Visual Micro. I’m still playing with it, but from what I see there is a lot of support in the Arduino forums. Seems like it could be a very cool thing! Head to Visual Studio. Open Tools -> Extensions and Updates. Search online for Arduino. The name of the extension is Arduino IDE for Visual Studio. I’m not going to lie, I like this. While I probably won’t include as many controllers, it would be a fun project. And this ocarina I have sitting next to me on my desk would become a handier device than, you know, an ocarina by itself! I’ve been working through the Arduino starter kit tutorials, but since I’m already familiar with wiring things together, I wanted to spend less time playing with wires and more time playing with circuit design. 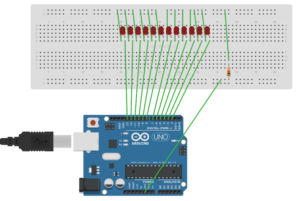 After doing some research for Arduino emulators, I came across circuits.io. This site seemed to be the best of breed when it came to being able to work across systems as well as being uber easy for a semi-newb like myself. And from the time I was young, I had always wanted to make cylon lights for my motorcycle. So, low and behold. The circuit! So, like 30 years ago plus some change, Tron happened. That started me off on numerous fantasies on building computers and robots. While I delved into robotics a tiny, tiny, bit back in the 90s, I’ve finally started playing with it again. This blog is my project tracker for all things in that realm. Have an uber amount of fun with it! I know I will!